There are all sorts of cat problems and questions. Well I am no expert in all of those, but here you will find links to those breed pages where someone has sent a cat question. I'm sure we all would appreciate if all the lovely cat people out there with knowledge about a specific situation would kindly pop into these question pages and give suggestions and comments. Also I hope everyone understands these are individual opinions, not professional advice. If in doubt, consult your cat breeder or vet. I shall group the questions here under general headlines. You shall find the specific questions pages when you click on the links given here. Well, this is a large subject to handle... But one that never ceases to interest cat people! My friend hates cats - my cat loves him, why? Questions about cat colors? How to name your cat's color? Shedding is normal, but sometimes it is too much... Nutrition? Genetics? Illness? 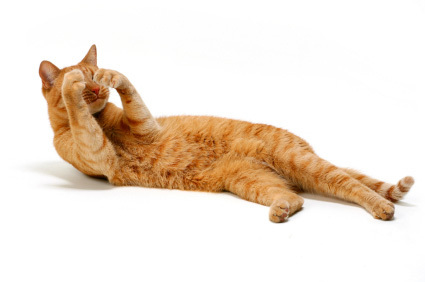 The photo of the cat with paws over its eyes is copyrigted by Istocphoto / MariyaL. Do not copy.